A community channel made for you. Check out channel 99 in select areas to view our friendly, neighbourhood Community Channel! Here you can find local weather, news, events, current previews and VOD movie trailers. Do you have an event coming up and need to get the word out there? 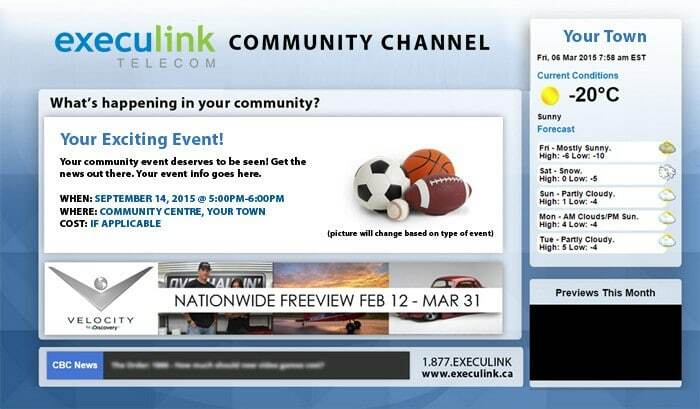 The Execulink Community channel (Channel 99) can display an advertisement of your event absolutely free! Just fill out the form below and we will contact you within one business day to let you know if your ad will be displayed or if we require any changes. Step 2: Wait for response within the next business day. Step 3: Tune in to Channel 99 to see your advertisement! Which communities would you like to broadcast your ad in?